The other day I had a life experience or a sad adventure or whatever you might call what I would call a lesson in what Advent is about. 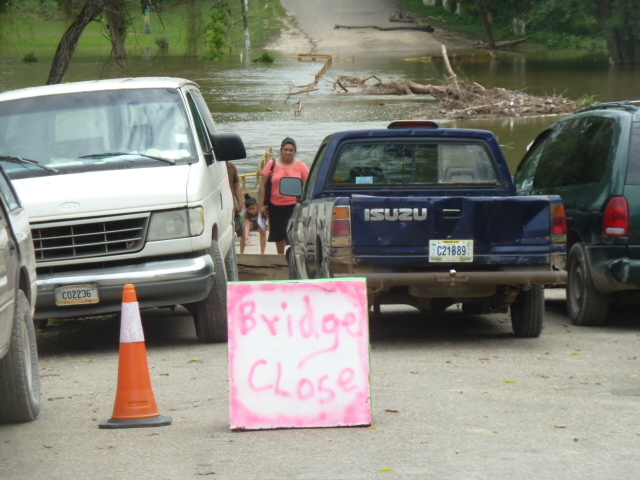 The bridge into San Ignacio, BZ has been under water twice since Oct. 27, this time for going on two weeks. The raining and mudding and flooding cause quiet desperation and hardship as people wait for relief, but hope shines through in this Advent season of waiting and hoping and anticipation, which is what Advent is all about. It’s been a most abnormal weather year in Belize–a quietly disastrous year because of a freakish series of cold fronts sweeping down from the Yucatan and remaining stationary, dumping rain on us for days on end. For sure, if you live in Belize, you live and plow ahead with a lot rain, in certain months, in a country famous for its beautiful and pristine rain forests. But the rain this year has been freakish, and, as I alluded to, disastrous in a quiet way. 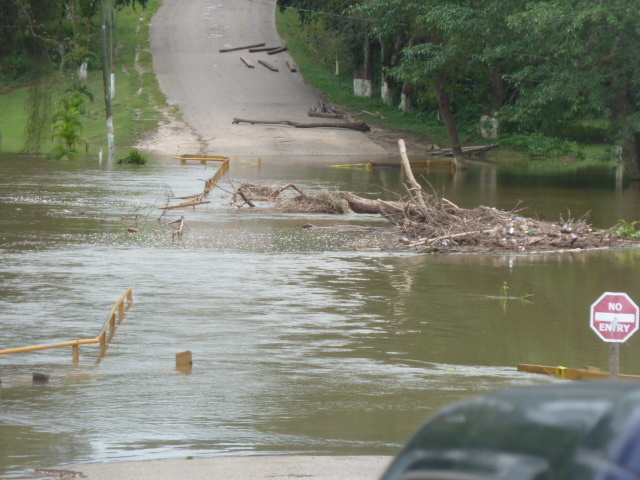 Belizeans have carried on through all of the hardship of the raining, mudding and flooding that have rendered so many roads and bridges impassable for days, and even weeks on end. Belizeans are accomplished at shrugging off hardship without much complaint and certainly without any whining. Now mind you . . . even with the terrible ripple effects that the flooding has had on the economy and livelihoods here–with tourism and the sugar cane crops largely wiped out just since a huge wave of rain struck back in late October–it’s a far cry from a disaster on the scale of what crushed a big part of The Philippines recently. But the frequent waves of rain here have contributed to widespread suffering, with the masses of Belizeans, who never whine, living nonetheless in what I see as the kind of quiet desperation of which Thoreau famously spoke. One of those recent, frequent waves of rain and flooding contributed to a death that I happened to end up witnessing at a hospital–a death that drove home that lesson to me about Advent, which I read in a Catholic magazine and will get to here. I was strolling to town one day, prepared to pull the trigger on my industrial-size umbrella in spite of a break in the rain at the time. Along the way I stopped to talk to a Belizean friend, who along with his two sons was about to head up to a remote place up in the mountainous bush to check on an elderly couple from their church. My friend explained that the couple, who attended church services or functions whenever they could walk down their hillside home to a road to catch a ride–whenever weather permitted–had not been seen nor heard from for what my friend simply said was “too long.” The friend and his sons were going to check on them and invited me to tag along, and I did. And I’m glad they had an extra pair of knee-high rubber boots for me. When I say the elderly couple lived in a remote part of the bush, picture us grinding up a road in my friend’s 4-wheel truck, with the road looking like mud soup for miles. Then imagine the four of us getting out of my friend’s truck and wading our way through for the next fifty minutes, in our knee-high rubber boots, to the home of the couple. All this with it raining off and on. What we found in the house was her husband, hanging on to life by a thread, suffering from what was to me the obvious stroke that was later confirmed, and him dehydrated. Long story short–we made a makeshift stretcher and got the man and his wife out of the virtual swamp to the hospital in town, where he was transferred to a better hospital down the highway and actually appeared, for a few days, to have a chance of recovering. Sad to say, the end of the story is that he didn’t live, and probably didn’t have a realistic chance of doing so (and especially no realistic chance in a third-world public hospital in Belize). It occurred to me in my processing all this life experience in beautiful Belize that the couple’s being stranded by too much rain and mud took its toll, and that too much rain and mud in Belize takes a lot of tolls on a lot of lives in a lot of ways that don’t get reported nor even much noticed. And then there’s the heat waves some weeks and months here, by the way, which take their tolls, too, in striking down people with heat strokes and such. For all its image as a pristine Eden and playground for adventure or relaxation–which it can be–Belize can be one hell of an unforgiving place to live and survive in for the masses of poor and desperate people who smile through so much of it with that famous Belizean sense of joy and hope. In this season of waiting, so many people are not waiting for holiday gifts or celebrations. They wait for the violence around them to stop, for aid after natural disasters, for return from refugee camps and battlefields and prisons. Even the smallest rays of light that we can provide by our efforts pushes back some of the darkness and, when joined to that of others, may begin to light a path of hope. The connection is obvious, isn’t it? Even though the man we went to check on eventually passed from this sometimes harsh and broken world, my friend made the effort to get to the sick man and his wife, who had been waiting and praying in desperation, but also in her steadfast faith and hope in God, her friend and her whole church family that rallied around her. Seeing her face light up when we arrived at her house–seeing her embrace her friend from her church family–was something to behold on that wet and dreary hillside homestead, in this wet and dreary Advent Season where so many wait and pray for relief.